In United States v. Croteau, 2016 U.S. App. LEXIS 6547 (11th Cir. 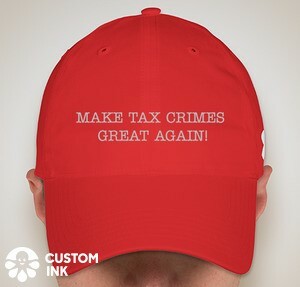 2016), here, the taxpayer was convicted or "ten counts of making false, fictitious, or fraudulent claims on his tax returns, in violation of 18 U.S.C. § 287 and 2, and one count of corruptly interfering with the administration of internal revenue laws, in violation of 26 U.S.C. § 7212(a)." Section 287(a), false claims, is one of the panoply of charges that the Government can make for tax crimes. Today's blog entry will deal with the § 287(a) charges. Crouteau's misconduct was repeatedly claiming false OID withholding and filing related forms with the IRS, resulting, he claimed, in refunds of well over $3.8 million. Early on, the IRS caught on and advised him to file corrected returns. Nevertheless, the taxpayer did not correct and repeated the behavior, which the IRS caught. And he "Croteau created, submitted, and recorded various fictitious and fraudulent documents claiming rights to millions of dollars owed him by the U.S. Treasury and various government agencies and officials." Finally he "recorded several false, fictitious, and fraudulent liens and documents in the Lee County Clerk's office asserting that the IRS and various IRS officials owed him hundreds of millions of dollars in total." On August 21, 2013, a grand jury indicted Croteau with ten counts of filing false, fictitious, and fraudulent tax returns with the IRS, in violation of 18 U.S.C. § 287 and 2. Croteau was charged for ten of the false and fraudulent tax returns he filed between September 2008 and September 2010 for tax years ranging from 2006 to 2009, in which he claimed total refunds in excess of $3.8 million. Separately, the grand jury indicted Croteau with one count of corruptly interfering with the administration of internal revenue laws, in violation of 26 U.S.C. § 7212(a) and 18 U.S.C. § 2. This charge was based on the alleged false and fraudulent tax returns covered by Counts One through Ten as well as the supplementary submissions supporting the tax refunds including the 1099-OID forms, the separate fictitious and fraudulent instruments Croteau submitted to the U.S. Treasury Department, and the fictitious and fraudulent liens and documents he recorded in the Lee County Clerk's office. As in many, perhaps most tax cases, there is little or no defense to the objective elements of the crimes charged, so that the defendant is left to the defense that he did not have the requisite mens rea for the defense. For the usual tax crimes in the Code, the mens rea is the highest -- that the defendant acted willfully, meaning that he intended to violate a known legal duty. The defense often deployed in such cases is that the defendant did not act willfully because he acted in good faith belief that what he was doing did not violate the law. This is commonly referred to as the Cheek defense, based on the leading case of Cheek v. United States, 498 U.S. 192 (1991). Technically, where this good faith defense is properly raised in a criminal case with an element that the defendant have acted willfully, the Government must prove that he acted willfully, which requires that the Government disprove the good faith claim. I have discussed previously the dicey issue of how the defendant puts good faith in play in order to get a jury instruction on good faith to supplement the standard jury instruction on willfulness. Bottom line it will usually require the defendant to testify, but sometimes there can be sufficient other evidence to raise the defense, thus permitting the defendant to forgo testifying. In support of his good faith defense, the defendant introduced testimony that he had joined a "a tax protester and sovereign citizen group called the Little Tribe of the Pembina Nation. This group advocated that its members did not need to submit to governmental authority or pay taxes." He then obtained other information from which "he came to believe that he had a secret Federal Reserve bank account containing money to which he was entitled. He also testified that he learned from Shrout that he could access his 'principal money' by using '1099-OID.'" Walker Todd, an attorney and tax-preparer who had worked for the Federal Reserve Bank. Todd discussed a number of the sovereign citizen theories, such as the idea that taxpayers can access secret accounts and the "redemption theory." Todd explained that these theories lacked "historical basis," were "not real," and were "totally fantasy." Todd explained that the IRS scam involving the use of 1099-OID forms emerged in the late 2000's and is considered one of the top tax scams in recent years. Todd testified that these ideas are promulgated through the Internet, seminars, DVDs, and YouTube videos, with Winston Shrout being one of the main proponents. It is not clear exactly how this testimony furthered his defense. Croteau's delusional condition caused him to persist in filing frivolous tax forms and documents despite repeated warnings and instructions by the IRS and others that what he was doing was unwarranted. Dr. Toomer testified that Croteau's response to these IRS warnings was to conclude, "[T]hat's wrong, that's not correct." Dr. Toomer could not say, however, whether Croteau had truly believed what he had said. That defense psychiatrist's credibility was substantially attacked on cross-examination. And the Government called a rebuttal psychiatric witness who disagreed with the defense psychiatrist. When charging the jury, as to the first element, the district court instructed that the jury must find that Croteau "knowingly presented a false claim." The court explained that the word "knowingly" means "that an act was done voluntarily and intentionally and not because of a mistake or by accident." As to the second element, the court instructed that the jury must find that the "claim was based on a false or fraudulent material fact." As to the third element, the court instructed that a "claim is false or fraudulent if it is untrue when made or presented and the person making or presenting it knows it is untrue." The court added that "the government does not have to show that the governmental department or agency was, in fact, deceived or misled." The Court concluded that "In this case, the evidence sufficiently proved that defendant Croteau knew the tax returns he filed with the IRS were false, fictitious, or fraudulent." Both parties agree that good faith is a defense to charged violations of § 287. Defendant Croteau argues that "a good faith belief that the tax laws [have] been satisfied, even if the belief is not reasonable," is a complete defense to false tax return crimes. The government does not contest Croteau's assertion. We note, however, that it is not clear whether good faith is a defense to a § 287 violation because all of the cases the parties cite involve not only different tax statutes but also statutes where "willfulness" or "specific intent" was an element of the charged crime. See Cheek v. United States, 498 U.S. 192, 193, 199-201, 111 S. Ct. 604, 606, 609-10, 112 L. Ed. 2d 617 (1991) (construing 26 U.S.C. § 7201, which requires proof of willfulness, and indicating that where willfulness is an element, a defendant's asserted good faith belief that he has complied with the tax laws—even if unreasonable—if believed by the jury, is a defense); United States v. Morris, 20 F.3d 1111, 1115 (11th Cir. 1994) (construing 26 U.S.C. § 7206(1), which requires proof of specific intent or willfulness, and recognizing good faith to be a viable defense to such a charged crime). Even assuming arguendo that a good faith defense were applicable in the context of § 287 violations, defendant Croteau has not shown that no reasonable jury could have failed to find that he had established that defense. Indeed, as outlined above, the evidence abundantly showed Croteau did not act in good faith. Furthermore, the decisions Croteau cites are cases where courts reversed a conviction and remanded on the basis that the defendant was denied a proper good faith jury instruction to which he was entitled. Cheek, 498 U.S. at 203-04, 207, 111 S. Ct. at 611-13; Morris, 20 F.3d at 1115-18; United States v. Heller, 830 F.2d 150, 154-56 (11th Cir. 1987). In contrast here, the district court gave a good faith jury instruction for all of Croteau's charged crimes. In convicting Croteau, the jury was free to disbelieve his testimony. See Williams, 390 F.3d at 1325. In sum, the evidence was more than sufficient to support Croteau's § 287 convictions. Section 287 requires the government to prove that a false claim against the government was made, “knowing such claim to be false, fictitious, or fraudulent . . . .” A Section 287 indictment should allege such knowledge, and the proof that the defendant knew the return was false is part of the government’s burden of proof. United States v. Holloway, 731 F.2d 378, 380-81 (6th Cir. 1984). It is not necessary to allege willfulness in the indictment. The term “willfully” is ot used in § 287 and is not “an essential element” of § 287. United States v. Irwin, 654 F.2d 671, 682 (10th Cir. 1981). The circuits vary, however, on the proof of intent necessary to convict for a violation of Section 287. In United States v. Maher, 582 F.2d 842, 847 (4th Cir. 1978), the Fourth Circuit approved a jury instruction stating that, under § 287, criminal intent “could be proved by either a showing that the defendant was aware he was doing something wrong or that he acted with a specific intent to violate the law.” In United States v. Milton, 602 F.2d 231, 234 (9th Cir. 1979), the court held that no instruction on “intent to defraud” is necessary where a false claim is charged (because it is not an element of the offense), but left open whether an “intent to deceive” is an element of a charge of submitting a “fraudulent” claim. Id. at 233 n.7. The Eighth Circuit, in Kercher v. United States, 409 F.2d 814, 817 (8th Cir. 1969), did not draw a distinction between false and fraudulent claims, but held without elaboration that § 287 requires proof of criminal intent. Obviously, if proof of criminal intent is required, the good faith defense would be available. I note also that on both of the types substantive charges, in addition to the substantive charge (§§ 287 and 7212(a)), the defendant was charged and convicted under the aiding and abetting statute. (The causer liability under 18 U.S.C. § 2(b) is not applicable.) The Government typically includes the aiding and abetting charge with the substantive charge. As charged, it really is not a separate crime but solely to make the person charged guilty as a principal if he is not otherwise guilty of the substantive crime. In this case, that is nonsense. See Townsend, John A., Theories of Criminal Liability for Tax Evasion (May 15, 2012). Available at SSRN: http://ssrn.com/abstract=2060496 or http://dx.doi.org/10.2139/ssrn.2060496. and Even More on Principals, Accomplices, Causers and Pinkerton Conspirators - the Daugerdas Case (Federal Tax Crimes Blog 5/10/11), here.